My wife has recently developed a habit of heading to Starbucks periodically – and she always seems to have a gift card. I was curious to where all of these gift cards were coming from – so I asked her, and she told me it was because she switched to Bing as a search engine. “So you’re telling me that you get gift cards sent to you just by using Bing instead of Google?” I inquired. I actually made the last part up. She didn’t say Bing-o. Only I would give a terrible pun like that on a moment’s notice. But as she showed me, Bing makes it worth your while to use them as a search engine with Bing Rewards. Yes, you could say, that it gives you more bing for your buck. Basically, Bing will send you a gift card for reaching a certain number of searches with their search engine. Gifts or gift cards from Starbucks, Amazon, iTunes, Burger King, JetBlue among others are all offered in Bing Rewards. It’s also an option to select donating your earned points towards a charity like Boys and Girls Club or Teach for America. Visit the Bing Rewards page or just Google search “Bing Rewards” and follow the first link. Wait, Bing search that. You need to create a Microsoft account or have it linked with a Facebook account. Use Bing as your primary search engine and watch the points rack up! I like this idea because it’s completely free, and I can choose to have it take up as much or little time as I want. Option A – Use Bing as your normal search engine and don’t change any habits. Depending on how often you use it, you’ll be get a pleasant surprise after a couple months when you’ve earned a $5 gift card. Option B – Play the system to maximize your points and redemption options. Bing allows you to earn 15 points per day on computer searches. 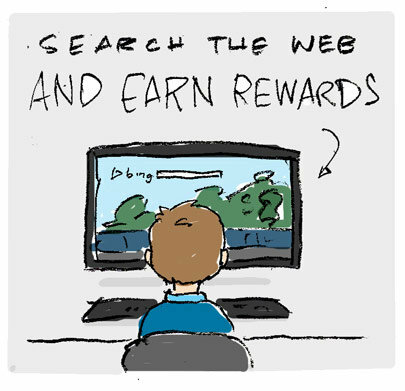 You earn 1 point for every 2 searches. For maximum efficiency, I click news stories that appear right on Bing.com. I rack up 30 searches in less than 90 seconds. Maximizing your point opportunities including mobile searches will earn you $5 gift cards in less than a month. So there’s a decision to be made – is it worth your time or not? It might help you get paid (albeit a minimum amount) for doing things you already do – searching the web, looking at daily news stories, etc. It may be an extra thing you don’t want to worry about. For me, my search for a search engine is over. Matthew is a freshmen high school math teacher, which combines his appreciation for math and passion to help young people. He has married up to his wife Allison and they live in Bellevue, Nebraska. Matthew saves money on his cell phone bill by using Ting Mobile. I’ve been searching Bing to pay for my son’s xbox live habit! Yes! I love Bing Rewards! Super easy way to support my Starbucks habit! I guess you are trading your privacy for cash, since I’m sure Bing is aggregating your facebook demographic information along with your searches and selling that info to ad targeting firms.